In the boat to the left stand Sir Guyon and the palmer, a pilgrim holding a palm branch who has returned from the Holy Land. 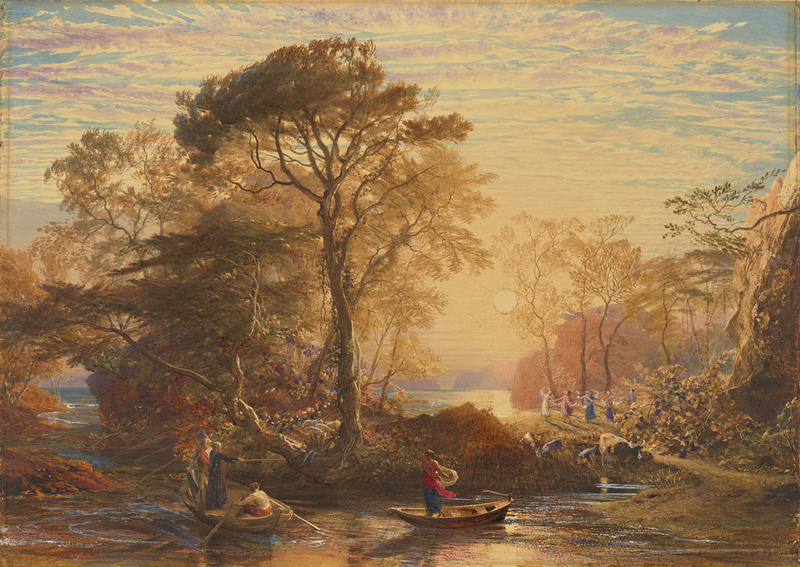 Phaedria stands in the boat to the right, gesturing across the Idle Lake to the Enchanted Isle on the right, replete with dancing nymphs glittering in the evening sun. The subject is adapted from a passage in the Faerie Queene, a poem first published in 1590 by the English writer Edmund Spenser. In the poem, however, Phaedria refused, much against Sir Guyon's wishes, to take the palmer as well, and he was left behind on the bank. In Samuel Palmer's adaptation, the palmer is included, presumably intended as an autobiographical reference. From the start, Samuel Palmer conceived this English Romantic narrative as a work of art in its own right. This visionary and idealized landscape is a highly finished and virtuoso display of his achievements with watercolor. From the dappled clouds to the melting sunlight that modulates all that it envelops, the range of technique is extraordinary. Much of the work was done with the point of the brush. Mrs. O.M. Pilcher, died 1987, by bequest to one of her executors, 1987. Private Collection (Executor of Mrs. O.M. Pilcher), sold to Thomas Agnew & Sons, Ltd., 1990. Thomas Agnew & Sons, Ltd. (UK), sold to the J. Paul Getty Museum, 1994.